The Saturday before Thanksgiving, Fluffy answered the door three times. This in itself was a little out of the ordinary, because Fluffy generally hides from door-knockers. You never know who’s going to be on the end of that knocking fist — a salesman, for example, or even a missionary from one of those crazy churches out there. But on Saturday, Fluffy answered the door three times, and on all three occasions the knocker was somebody we knew and loved, and on all three occasions the knocker was somebody who was performing a surprise act of service for Fluffy and me. Three of them — all in one day! That’s one of the bizarre things that happen when you turn into an old person. It is also fairly common in our church, where the members really do look out for each other. The first incident had a crazy story attached to it. John, one of our home teachers, came to our door with a pan of funeral potatoes and a bag of salad greens. This was a real treat. Who doesn’t love funeral potatoes (unless they are actually made to accompany a funeral, which is not near as fun)? I have mentioned John in this column before. He does a lot of traveling, and he sends us selfies wherever he goes. The last time he went to Kuala Lumpur, he took a picture with the Petronas Towers behind him and I said he looked jowly. This time he was careful to crop off the bottom of his face so his jowls did not show. He has an endearing sense of humor, even when he does not bring funeral potatoes. 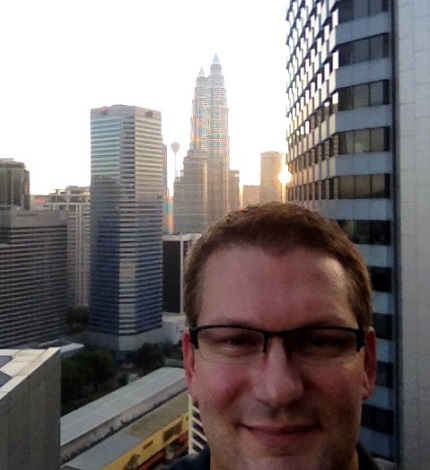 John does not usually have jowls, but just in case he cropped off the bottom of his face when he took a picture of himself with the Petronas Towers in the background. He did not want accusations to fly. We asked John why he brought us a fresh pan of funeral potatoes on a Saturday morning, and he said it was due to a slight misunderstanding on the part of his wife, Michelle. Michelle is the visiting teacher of a lady who does not ever come to church. Unfortunately, the lady’s husband got an E. coli infection and died from it last week. Naturally Michelle asked what she could do. Somehow the message that Michelle got was that the funeral would be held in Baltimore, and they would need salad and funeral potatoes to feed 200 people. Michelle rolled up her sleeves and did just that. With the help of her two daughters, she did a funeral potato assembly line. She made thousands of them, and bought many bags of salad greens to accompany them. Surprise! It was only after she was up to her ears in funeral potatoes that she learned that the two hundred funeral attendees were going to be eating African food. Michelle had only been asked to make enough potatoes and salad to feed two people — the mother and father of the woman she visit-taught, who preferred more traditional funeral foods. I was upstairs working when John arrived, so I had him schlep himself upstairs to the second floor and visit with Fluffy and me in my office, just because it’s so hard for me to get downstairs. It was only after we had been visiting for a half hour or so that he confessed he had just gotten out of the hospital after having hernia surgery. Indeed, the only reason he was able to escape with the funeral food for us was that Michelle was up in Baltimore attending the funeral with two hundred Africans. John was supposed to be lying in his sickbed, recuperating. He wasn’t even going to church on Sunday. We promised to not tell Michelle about his transgression. It’s not often that you have somebody who is so intent on doing a good work for you that he will get out of his sickbed to bring you funeral potatoes. John is a man among men. But this was not the first thing he had done for us this week. Oh no. Where do you even get home teachers like that? All I can say is, when the home teacher and visiting teacher programs were being designed, John and Michelle were the people they were thinking about as the poster boy and the poster girl for what the perfect home teacher and visiting teacher should be. They don’t get any better than that. I’m just glad they don’t read my column, because I don’t think either one of them would be happy about all the publicity. And I also think John would be in trouble if Michelle found out he’d gone out in the car and climbed our stairs when he was supposed to be flat on his back in bed on Saturday morning. That’s what I think. So, friends of John and Michelle, mum’s the word. But this was only the first visit we received. In the late afternoon, we got a knock on the door from a friend with a leaf-blower, just letting us know he was on the premises blowing leaves. This was the second time this week he had done so, but we had not been home last time. We were out of town when Jeff had come previously, but John’s email had said it “looked like the backyard was done.” Yes, it was done because Jeff had done it. Jeff had blown every last leaf off our yard with such precision it looked as though we lived on a golf course. He got rid of the walnuts too, no doubt to the consternation of the squirrels who lived in the trees in our yard. But he was back for an encore. And he, too, came inside for a welcome visit. We treated him to some funeral potatoes, and then he got back to work. No doubt the squirrels were disgruntled. Less than an hour later, our friend Jim, also from church, came over with a loaf of bread from Great Harvest Bread Company. He did not come in for a visit. He knocked. He gave Clark a loaf of bread. He left. No reason. He just did it. Amazing. We are told to give acts of service. Giving acts of service is what we do as followers of Christ. The very act of becoming a Christian implies learning to give — to stretch one’s hand out in an act of service, not just once, but often. Not just daily, but more than once a day. Giving acts of service becomes a way of life. It becomes who we are. What we often forget is that every act of service has an implied recipient. Somebody has to be on the receiving end. Unfortunately, we tend to ignore the receiving part. Indeed, we often pride ourselves on how independent we are from needing any help from others. We can be lying in bed with a broken leg and no food in the refrigerator and flatly refuse any help from friends who offer to bring over a pot of soup. But in refusing to accept help when we need it, we are refusing to allow people to give service, and we are refusing to learn humility by learning to accept service. This was a hard lesson for me to learn, but God has an impish little sense of humor about things like this. He calls it “old age.” As age-related maladies make us more and more helpless, it gets pretty much impossible to say no. So visits from people like John and Jeff and Jim are no longer impositions ─ they are godsends. And I mean that literally, so I guess I’ll capitalize it. They are sent from God. Hebrews 13:2 says, “Be not forgetful to entertain strangers: for thereby some have entertained angels unawares.” We are not unaware. When Fluffy opens our door to the Johns and the Jims and the Jeffs of the world, he knows full well Whose messengers they are. And we are grateful every day that they have the ears to listen to His inspiring voice, and the willingness to act upon His suggestions.